APRIL 5 , 2 0 1 9 | 2 9 AD AR II 5 7 7 9 | V O L . 9 9 | NO . 2 5 | c A nd LeLi g H Ti ng | FRID AY , APRIL 5 , 7 : 3 5 P. M.
PAm mOnSKy Community Development Liaison, ADL-CRC On Tuesday, March 19, more than 60 law enforcement professionals from across the Omaha metro area came to the Jewish Community Center for the Second annual Jule M. Newman Law Enforcement Summit hosted by the ADLCRC. The summit featured three break-out sessions and a keynote address by Oren Segal, Director of the Center on Extremism for ADL National. Oren Segal addresses law enforcement summit. The break-out sessions featured Anatomy of a Hate Crime led by Thomas Reinwart, Special Agent FBI; Civil Rights led by Darryck Dean, Conciliation specialist at the Department of Justice; and, Managing Implicit Bias for Law Enforcement led by Mary Newman, retired OPD and Daisha Muhammad, ADL project manager for Managing Implicit Bias for Law Enforcement. Oren Segal focused his presentation on how extremism is spreading throughout the nation and the world and how the staff at the Center on Extremism work to combat extremism on a daily basis. One attendee commented, “Oren Segal’s presentation was impactful. It validated the need for proactive searches on social media regarding threat assessment.” Another said, “Oren Segal was very engaging and well versed in extremism,” and, “The Implicit Bias training and presentation is very useful. Breaking into smaller groups was great.” Later that afternoon, Mr. Segal spoke to attorneys about the legal challenges involved in combating extremism. The day ended with an informal presentation at Vincenzo’s restaurant for Wine and Conversation, a collaboration with National Council of Jewish Women, Nebraska. The Jule M. Newman Law Enforcement Summit was made possible through the generous funding of the Jule M. Newman Anti-Bigotry Endowment Fund at the Jewish Federation of Omaha Foundation. The fund sponsors specific programming designed and conducted by the ADL-CRC Plains States Regional office. Knowing that their father respected the mission of the ADL-CRC, Jule’s sons Bob, Jim and Murray chose the organization as the beneficiary of the fund. Jule had a strong interest in law enforcement; therefore, the fund ensures that anti-bias training for law enforcement officers will be held annually. Marty & Kathy Cohen Tish Selk A member of the franchise system of BHH Affiliates, LLC. 9959 Rockbrook Road $675,000 Rockbrook Westside/District 66. Outstanding 2 Story 4600 sq. ft. residence, 4 bedroom, 5 bath, 3 car garage. Updated massive custom kitchen, open to oversize dramatic family room. Impressive owner’s suite with sitting room, a bank of built-ins and large walk-in closets. Situated on .54 acre beautifully landscaped park-like corner lot. continued from page 1 Kearney, Nebraska, and Des Moines, Iowa. More than 100 then showcased in a permanent display at The Durham Mu- nonprofits were nominated for the “All Makes 100-year-100k seum. This year’s gala will take place Wednesday, April 17 at office makeover contest.” A team of judges composed of com6 p.m. at the Holland Performing Arts Center. munity leaders and vendor sponsors voted and narrowed it Jeff Kavich is the President and CEO of All Makes Office down to five non-profits in each market. Then, communityEquipment Co. and in that role oversees all day-to-day activ- wide voting took place over a one-month period. 73,480 votes ities in the Omaha headwere placed on the voting quarters. Jeff participates in platform before the winmajor projects and lends ners were announced. his personal guarantee of In Omaha, the Autism satisfaction on every projCenter of Nebraska— ect. His involvement prowhich supports and envides long-term direction hances the quality of life for to the continuing growth of persons with autism and All Makes. other developmental disAmee Zetzman is the Exabilities and their families. ecutive Vice President and In Lincoln, the Child CFO for All Makes Office Guidance Center, is dediEquipment Co. and Jeff ’s cated to providing childsister. In addition to overcentered, family-focused seeing all day-to-day activmental health services in ities in the Lincoln, Kearney Lincoln. and Des Moines, IA, stores, In Kearney, the HelpAmee is responsible for all Care Clinic—which profinancial matters, as well as vides life-changing medical overseeing the purchasing, care to the uninsured, imcustomer service, opera- Clockwise from top center: larry Kavich, amee Zetzman, lazier Kavich poverished residents of Bufand Jeff Kavich tions and IT departments. falo and Kearney Counties. Jeff played an instrumental role in the implementation of And, finally, in Des Moines, Meals from the Heartland — All Makes’ Quality Improvement Process in the early ‘90s and their vision is to alleviate life-threatening hunger through edcontinues adapting those teachings to current work trends. ucation, engagement and feeding. Jeff remains actively involved with several office furniture inPrior to the 100th anniversary contest, All Makes had done dustry organizations, community boards and nonprofit or- three non-profit makeovers: Angels Among Us, Friendship ganizations. Home, and Ollie Webb. All Makes has done work for several Amee has been with All Makes since 1994 and is part of the other nonprofits including Ronald McDonald, Heartland fourth generation of her family to run the 100-year-old busi- Family Services, and the Women’s Center for Advancement. ness. Prior to joining All Makes, Amee was a manager for “It’s not enough to be a business,” Amee said. “We have to Arthur Andersen & Co., specializing in small business clients. be a partner, a family member. We are part of the fabric of the Zetzman received her bachelor’s degree from the University community. That means stepping up when we see a need.” of Colorado, with a major in Accounting. She is proud to As was the case recently, when a call went out on All Makes’ serve on several local community boards, nonprofits and in- Facebook page: anyone who, due to flooding, needed a dry dustry-specific organizations. work space could reach out. It was 1918 when Jeff and Amee’s great-grandfather Harry “We were heartbroken to hear the stories of those impacted Ferer first opened the All Makes Typewriter Company. After by the awful flooding in Nebraska and Iowa,” Amee said. “As 20 years, Ferer’s son-in-law Lazier Kavich took over, adding a family-owned company, we wanted to help. We were happy government surplus and used office furniture to the inven- to provide office space and WiFi access at any of our office tory. In 1960, this prompted the name change to ‘All Makes locations in Nebraska and Iowa to anyone displaced or imOffice Equipment Company.’ Lazier’s son Larry joined the pacted by flooding. We were also able to provide office furcompany in 1965 and eventually passed the family business niture to businesses in need.” to his children in 2004. Earlier this year, All Makes worked with Alley Poyner MacAll Makes is part of the Omaha landscape. Cities change chietto Architecture to furnish items to the Girls, Inc. of and Omaha is no different, but in the middle of all that Omaha Protégé House, which bridges the gap between childchange there is great comfort in seeing a business with true hood and adulthood by providing transitional housing to girls staying power. Just let it sink in for a moment: they have been who age out of foster care. here for a century. Not only has All Makes been around that The All Makes showroom used to be filled with nothing long, the company has grown and continues to be successful, but desks, chairs and filing cabinets. both as a business and as a community partner. “If you walk through the showroom today,” Jeff said, “you’ll Trust, honesty and integrity: these are the core values the see some soft seating, you’ll see some work stations, you’ll see Kavich family has lived by all these years. Nowhere is that some demountable wall products lighting: you’ll see so many more obvious than in the non-profit work the family does. different things that are so different than what the industry To celebrate the company’s centennial, All Makes used looked like 30 years ago.” And because some things don’t $100,000 to donate remodeled workspaces for a deserving change, they still have typewriters. nonprofit in each of their locations: Omaha, Lincoln and That, and big hearts. Fran and Rich at the Synagogue in Maputo, Mozambique. Armenia, Tunisia and the Democratic Republic of the Congo. The talk will be about these, plus their most recent visit with two Israelis living on the remote semi-autonomous island of Niue. Where is Niue, you ask? I had to look it up. According to Wikipedia, Niue is an “island country in the South Pacific Ocean, 1,500 miles northeast of New Zealand, east of Tonga, south of Samoa, and west of the Cook Islands.” Larry Blass will serve as service leader, and a wonderful oneg will follow the service. We hope to see you there! Continued from page 1 the Holocaust, the story of their search for the St. Louis passengers. Scott has also taught Jewish History for the Jewish Studies Program at the American University, in Washington, DC. His address is titled Searching for Survivors – the Fate of the St. Louis Passengers. Scott Littky, Executive Director of the Institute for Holocaust Education, Kael Sagheer, Education Coordinator, in collaboration with all three synagogues, have worked tirelessly to put together a meaningful evening. As the host congregation this year, Rabbi Brian Stoller Scott Miller of Temple Israel has led the process of making Yom HaShoah a meaningful experience for all who attend. “The annual Yom HaShoah Commemoration is a meaningful event for our community,” Scott Littky said, “and becomes even more meaningful when we all work together. Having the clergy from our synagogues assisting in the planning of the evening has been very important in supporting us at the IHE in making our annual commemoration meaningful for all of those in attendance.” The Youth Program for our local teenagers will begin at 5:30 p.m. and includes dinner and a discussion among local survivors and our students. Those in attendance will first view the short film Pigeon. The focus of the discussion will be on our moral responsibility for each other, especially in times of danger. “Having different generations represented is essential,” Littky says. “In addition to teaching our youth, it is important to remember the Holocaust; we welcome the opportunity to pair some of our survivors with our youth. By spending time together, they can make a more personal connection.” For more information about this year’s Yom HaShoah, please contact Scott Littky at slittky@ihene.org. The faces of Jewish summer camping Omahans Phoenix, left, and Sophia Mavropoulos, children of Karen Klingberg and Dimitrios Mavropoulos. Purim was celebrated with gusto all over the Jewish community, with the highlight being the crowining of the Purim King and Queen, top right, Alvin Abramson and Jean Elkon. The two royals will have their portrait displayed with those of their predecessors in the Rose Blumkin Jewish Home. They will remain King and Queen until next year, so be sure to make a bow when you run into them. Ozzie NOgg Omahaâ&#x20AC;&#x2122;s favorite literary maven, Nancy Rips (aka Fancy Nancy) hosts a Book Swap at her home on Tuesday, April 9 from 7 to 9 p.m. Her goal? To always make books accessible and entertaining. â&#x20AC;&#x153;I want reading to be exciting for people,â&#x20AC;? Nancy said. â&#x20AC;&#x153;At the end of the day, itâ&#x20AC;&#x2122;s got to be fun.â&#x20AC;? An author in her own right, Nancy has sold books in Omaha book stores for over forty years and promoted books on TV and radio since 1981. Her Boomer Radio colleague, Dave (Wingy) Wingert, calls Fancy Nancy, â&#x20AC;&#x153;A treasure, a stand-up broad of fashion and taste, a generous and loving friend. And her books look damn fine on my shelf.â&#x20AC;? The Book Swap is part of Beth El Synagogueâ&#x20AC;&#x2122;s Miriam Initiative, a series of ongoing projects and programs created, developed and presented by Beth El women. music somewhere mashed up in there.â&#x20AC;? Jaffa Road plumbs the history of diverse cultures for inspiration, even reviving protest songs â&#x20AC;&#x201D; discovered in wax cylinder recordings made in Turkey in 1907 â&#x20AC;&#x201D; written to oppose the conscription of Jews into the armies of the Ottoman Empire. â&#x20AC;&#x153;We take what is old and bring it forward so it can be seen in a new light and appreciated in a new way,â&#x20AC;? Chernick said. â&#x20AC;&#x153;And breathing new life into it, too,â&#x20AC;? Lightstone added. â&#x20AC;&#x153;So itâ&#x20AC;&#x2122;s not like museum music.â&#x20AC;? Jaffa Roadâ&#x20AC;&#x2122;s debut album, Sunplace, received a Juno nomination in 2009 for world music album of the year. When their version of Lo Yisa Goy won the 2009 John Lennon Songwriting Contest grand prize in the world music category, Lightstone said, â&#x20AC;&#x153;It was validation that you can do world music in Hebrew.â&#x20AC;? Their second album, Where the Light Gets In, was released in 2012 and won the World Music Group of the Year at the 2013 Canadian Folk Music Awards. According to a review in the Canadian Jewish News, Jaffa Road creates a unique sonic landscape that takes listeners on a journey that is at once ancient and modern, acoustic and electronic, sacred and secular. â&#x20AC;&#x153;We are lots of different strains that come together,â&#x20AC;? said Lightstone. â&#x20AC;&#x153;Hopefully the sum is something new.â&#x20AC;? â&#x20AC;&#x153;Weâ&#x20AC;&#x2122;re very excited to have Jaffa Road perform at our May 5 Seth Rich Memorial Camp Scholarship Fund Concert,â&#x20AC;? Hazzan Michael Krausman said. â&#x20AC;&#x153;Providing service grants and Jewish camp scholarships in Sethâ&#x20AC;&#x2122;s name is only possible through the generosity of the members of our Beth El family and our friends in the Omaha Jewish community and beyond. We thank you for your support.â&#x20AC;? Jaffe Road to California Street will include the voices of BESTT and Beth El Hebrew High students. A dessert reception follows the concert, giving audience members a chance to meet the guest artists. Chairmen for Jaffa Road to California Street: A Concert to Benefit the Seth Rich Memorial Camp Scholarship Fund, are Mary and Joel Rich and Pam and Bruce Friedlander. For information on individual ticket pricing and sponsorship opportunities, please visit the Beth El website at http://bethel-omaha.org or call the synagogue office at 402.492.8550. All giving levels include at least two concert tickets at no extra charge. Donations are tax deductible. Contact our advertising executive to promote your business in this very special edition. Tri-Faith initiative dinner in abraham’s Tent 6405 S. 171 St. | NEW PRICE! | $389,000 Gorgeous 4 BR/4BA 2-story in Mission Park with so much to love and over 4,100 finished square feet! Call David and Bobbi Leibowitz at 402-496-7499 and expect to be impressed. Please let the Jewish Press know in advance when you are leaving and when you are returning. Sometimes several papers are sent to your “old” address before we are notified by the Post Office. Every time they return a paper to us, you miss the Jewish Press and we are charged! Please call us at 402.334.6448 or email us at jpress@jewishomaha.org. Tri-Faith Initiative, its relationships with the faith communities of Omaha and helped create the Memorandum of Understanding which outlined the future of this bold endeavor. In addition to honoring these members of the community, Tri-Faith will also honor Cantor Wendy Shermet with a musical performance. Cantor Wendy Shermet has been a beloved part of the Temple Israel clergy since 2001. Keynote speaker for the event will be Wajahat Ali. Ali is a journalist, writer, lawyer, an award-winning playwright, a TV personality and a consultant for the U.S. State Department. He helped launch the Al Jazeera America network as co-host of The Stream, a daily news show that extended the conversation to social media and beyond. He is a Peabody-nominated producer of the series The Secret Life of Muslims, a series of short-form, first-person documentary films featuring a diverse set of American Muslims. Interim Director Wendy Goldberg will address the audience in a call to action and an invitation to reflect both inwards and to reach out in connection with the broader Omaha community. The Dinner in Abraham’s Tent is an important step in connecting with the faith community in Omaha and creating lasting relationships. For more information, please contact ujawed@trifaith.org. Deana Sussman Berezin. Once you have finished your link it will be sent off for bronzing, and we will gather again on Sunday, May 5 to place the links on the sculpture. After dinner and the link workshop, we will move to the sanctuary for our multi-generational Chocolate Shabbat service! This special service features our Kol Chokolad kids’ choir followed by a very chocolate oneg. The sweetness of their voices will increase the sweetness of our Shabbat. The chocolate won’t hurt either! Ron Lugasy JFO Community Shlicha When around us the tension is growing, we see an increase in hate crimes based on race, religion or other differences. The upcoming elections in Israel bring a lot of questions and arguments and our event ‘Four Cups of Freedom’ is an opportunity to join the conversation. We invite you to find a spot at a table, listen to our speakers and, with a glass of wine in one hand and some snacks in the other, share your thoughts. Our speakers are: Max Perry Mueller. Assistant Professor of Religious Studies, the University of Nebraska-Lincoln and the co-founder of religion andpolitics.org. Max Perry Mueller (PhD, Harvard University) is a historian and theorist of race and religion in American history and culture. He is the author of Race and the Making of the Mormon People and the forthcoming Wakara’s America: A Native and American History of the West. Max will talk about The Limits of American (Religious) Exceptionalism. Dr. Curtis Hutt. Associate Professor of Religious Studies, Executive Director at the Goldstein Center for Human Rights, Director of Programming at the Schwalb Center for Israel and Jewish Studies, University of Nebraska at Omaha. Curtis completed his Ph.D. in Religion and Critical Thought at Brown University. His expertise is the history of Judaism and Christianity. He has studied and worked in a wide variety of institutions in Jerusalem since 1985. Dr. Curtis Hutt will talk about Freedom from Religion in Israel. The event is sunday, april 7, 5:30-7 p.m. at the JCC auditorium. It is free and open for all. If you are interested to know more, please contact Community Shlicha Ron Lugasy at rlugasy@jewishomaha.org. traveling art installations (provided by the Institute for Holocaust Education), firsthand accounts from survivors, educator-led talkbacks with the ADLCRC, cast and production team, and free admittance for all OPS students to any Sunday matinee performance (made possible by the Omaha Public Schools Foundation). The play will be performed at the Jewish Community Center April 5, 6 and 7 (All Performances at 7:30 p.m.); at South High (4519 S 24th Street, 68107) April 7 at 2 p.m. – Open to the General Public, OPS Students admitted FREE; at The B Side of Benson Theatre (6058 Maple Street, 68104) April 11, 12, 13, 19 and 20 (All Performances at 7:30 p.m.); at Benson High School (5120 Maple Street, 68104) April 14 at 2 p.m. – open to the general public, OPS students admitted free; at Burke High School (12200 Burke Street, 68154) April 21 at 2 p.m. – open to the general public, OPS students admitted free. $30 general admission, $25 student/65+/military. For more information, please visit the Brigit St. Brigit website, www.bsbtheatre.com, or contact Scott Kurz, skurz@bsbtheatre.com, 402.616.3766.
community Leadingage Leadership summit aNNette vaN de kamp Editor, Jewish Press As Executive Director of the Rose Blumkin Jewish Home, Chris Ulven wears many hats. Sometimes, his duties take him out of the Home, most recently on a plane to Washington D.C. to partricipate in the LeadingAge Leadership Summit. Chris Ulven, second from right, back, with the other participants from Nebraska. were dealing with the flooding back in Nebraska, but we had meaningful conversations with their representatives nonetheless. We addressed HR 1265 — the Nursing Home Workforce Quality Act, which was introduced in February of this year, as well as S2888 — the Geriatrics Workforce Improvement Act.” Fun fact: on the flight home, Chris had a conversation with another passenger — who turned out to be Senator Ben Sasse’s daughter. LeadingAge focuses on a wide variety of issues that aﬀect our elderly, such as the availability of low-income housing, managed care and integration of services, Medicaid, Medicare and hospice services, to name but a few. More information about LeadingAge and how its advocacy impacts all seniors can be found at www.leadingage.org. B’nai B’rith Breadbreakers meets weekly on Wednesdays at the Rose Blumkin Jewish Home auditorium from noon to 1 p.m. For specific speaker information, please email Gary.Javitch@Gmail.com, Breadbreakers chairman. For more information or to be placed on the email list call 402.334.6443 or bnaibrith@jewish omaha.org. aNNette vaN de kamp-WriGht Editor, Jewish Press Passover is rapidly approaching and that means it’s a busy time at the Rose Blumkin Jewish Home, especially in the kitchen, where Director of Food Services Mike Aparo has his work cut out for him. It is no surprise that, during Passover, the regular Friday Deli is closed. But have no fear: there is an alternative option during the holiday. Please mark your calendars for the Annual Passover Evening Deli, tuesday, april 23 from 5 till 7 p.m.
On the menu is, of course, Star Deli’s famous Latke Reuben. For the uninitiated, that’s “two crispy latkes sandwiched with a halfpound of our premium homemade corned beef, Thousand Island dressing and sauerkraut,” according to Aparo. If you have never had one, don’t let this opportunity pass you by! Or maybe you’ll be more tempted by the ‘Brisket Plate.’ “We smother our briskets with sautéed onions, celery and garlic and slow braise them in beef stock and balsamic vinegar until they are melt-in-your-mouth tender,” Aparo promised. The usual deli meats, such as pastrami, corned beef, pickled tongue, smoked turkey and salami, as well as the chopped liver, tuna and egg salads will all be served on a matzoh roll. There is no need to RSVP, just show up april 23 and bring your family and friends. “All of us at Star Kosher Deli wish everyone a happy and healthy Pesach,” Mike Aparo said. “We really look forward to see you all there!” For more information about Star Deli and how to take advantage of the kosher catering services, visit the Facebook page at https:// www.facebook.com/star.deli.rbjh/ or go to www.rbjh.com/life style/dining. Jewish Press readers, If you do business with any of our advertisers, please tell them you saw their ad in the Jewish Press. It really helps us! Class of 2019 host an early minyan, followed by a delicious kiddush brunch. We will also host an all-day open house; and guests are encouraged to stop by anytime for schmoozing, snacking and meaningful connections. More information on Saturday offerings will be available on Friday night. All Jewish community members are encouraged to be part of the of this signature Nebraska hospitality welcome; location for the event will be announced soon, so please stay tuned for more information. Please contact Julie at office@ochabad.com or 402.330.1800 to be part of the action. We will be publishing our annual High School Graduation Class pages on May 17, 2019. To be included, email us the graduate’s name, parents’ names, current high school and the college you plan to attend, plus a photo to: jpress@jewishomaha.org by May 1, 2019. Sunday, April 14 is the third annual ‘A Institute of Religion in 1998. He trained as a Day of Learning’. This revamp of the tradi- Jewish Educator at HUC’s Los Angeles camtional Global Day of Jewish Learning brings pus, where he received an M.A. in Jewish our community together to enjoy a unique Education. Rabbi Zweiback is also an author, take on learning and engagement through musician and composer. His publications inthe efforts of the Klutznick/Creighton Cus- clude the Teacher’s Guide to Shalom Ivrit II; todial Fund and the JewDay of Days; and Days of ish Federation of Omaha. Wonder, Nights of Peace: The committee looks to Family Prayers in Song for honor individuals who Morning and Bedtime. As have a long history of part of inspiring his band, sharing their passion. The Mah Tovu, he has released first year of the series three albums, published honored Steve Riekes two books, and performed through laughter. Last across the United States. year honored Gloria The Day of Learning Kaslow for her work with through Music is made refugees to Omaha. possible through the supThis year we will honor port of the Jewish FederDebbi and Speedy ation of Omaha Zweiback for their lifeFoundation’s Klutznick/ Speedy and Debbie Zweiback long commitment to Creighton Custodial music and Jewish learning – Building Fund and the Jewish Federation of Omaha. Bridges through Music. We will have the ad- The Klutznick Chair in Jewish Civilization ditional pleasure and honor of Rabbi Josh at Creighton University was established by “Yoshi” Zweiback who wll teach text Mr. and Mrs. Philip M. and Ethel Klutznick through music. The Zweibacks will share in 1988. Its purpose is to provide an outtheir passion of learning through the arts. standing program in Jewish civilization Jewish Federation of Omaha CEO, Alan with educational and cultural enrichment Potash shared, “I have witnessed the com- for Omaha’s Jewish community. Mr. mitment of both Speedy and Debbi in our Klutznick died in 1999; his generous legacy community throughout my life on a variety continues in the activities of the Chair, its of levels for a variety of causes. They are annual symposium and other activities in both terrific role models for our commu- the community. nity, personally and professionally. I am esThe event is open to the community free pecially excited they are bringing Josh to of charge. Your RSVP is kindly requested. Omaha as an integral part of the afternoon.” To do so and for further information, please Rabbi Yoshi Zweiback was ordained as a contact Mark Kirchhoff at mkirchhoff@ Rabbi by the Hebrew Union College Jewish jewishomaha.org or 402.334.6463. Pre-order forms available by emailing friedelacademy@fjaomaha.com. Pre-order forms are due with full payment to the school oﬃce by April 17. Proceeds from the sale goes to support the work of our great teachers. ism out of concern that it could also end up censoring moveBen sales JTA ments like Basque separatism or pride in the United States. But Facebook and Instagram announced a ban on posts that in- conversations with experts convinced the company that “white volve “support and representation of white nationalism and nationalism and separatism cannot be meaningfully separated from white supremacy and orseparatism.” ganized hate groups.” e social networking giant “Going forward, while peoannounced the ban on ple will still be able to demonWednesday and will begin enstrate pride in their ethnic forcing it next week. heritage, we will not tolerate “It’s clear that these concepts praise or support for white naare deeply linked to organized tionalism and separatism,” the hate groups and have no place post added. on our services,” a post by Facebook also announced Facebook, which owns Instathat it would begin connecting gram, said. “Our policies have people who search for hateful long prohibited hateful treatterms to resources that help ment of people based on char- The Facebook logo at an innovation hub in Berlin, Germany. Credit: Sean Gallup/Getty Images people leave hate groups. acteristics such as race, Last year, Facebook CEO Mark Zuckerberg sparked backethnicity or religion — and that has always included white lash when he said the site would not remove posts denying supremacy.” Facebook did not at first extend that ban to white national- the Holocaust. schedule an appointment with your physician. Untreated swimmer’s ear can lead to complications. In the air When airplanes rise in elevation, air pressure changes, causing ears to clog. Try alleviating ear pressure by moving areas of the face. Move the mouth in up and down motions, chew gum, yawn or try swallowing while pinching your nose closed to help equalize the pressure. If you are traveling with an infant, give him or her a bottle or pacifier to encourage swallowing. at the Park Summer is a wonderful time to enjoy fireworks and outdoor concerts. Due to immense pressure, the noise at these events can cause immediate damage to unprotected ears. When attending loud events, sit farther from where the noise is coming from and consider using hearing protection. You can purchase protective headphones or earplugs at your local supermarket or sporting goods store. How is this publication thinking about the future? Announcements may be e-mailed to the Press at jpress@jewishomaha.org or mailed to 333 So. 132 St., Omaha, NE 68154. Readers can also submit announcements -- births, b’nai mitzvahs, engagements, marriages, commitment ceremonies or obituaries -- online at the Jewish Federation of Omaha website: www.jewishomaha.org. Click on “Jewish Press” and go to Submit Announcements. Deadlines are normally eight days prior to publication, on Thursdays, 9 a.m. Please check the Jewish Press, for notices of early deadlines. FREE Venus Legacy skin tightening/wrinkle reduction treatment developed in Israel with a Zerona Package (a $600 value) Call for a free consultation. (Founded in 1920) Abby Kutler President Annette van de Kamp-Wright Editor Richard Busse Creative Director Susan Bernard Advertising Executive Lori Kooper-Schwarz Assistant Editor Gabby Blair Staff Writer Thierry Ndjike Accounting Jewish Press Board Abby Kutler, President; Eric Dunning, Ex Officio; Laura Dembitzer; Candice Friedman; Jill Idelman; Andy Isaacson; Michael Kaufman; David Kotok; Natasha Kraft; Debbie Kricsfeld; Eric Shapiro and Amy Tipp. 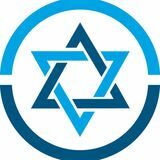 The mission of the Jewish Federation of Omaha is to build and sustain a strong and vibrant Omaha Jewish Community and to support Jews in Israel and around the world. Agencies of the Federation are: Community Relations Committee, Jewish Community Center, Center for Jewish LIfe, Jewish Social Services, and the Jewish Press. Guidelines and highlights of the Jewish Press, including front page stories and announcements, can be found online at: wwwjewishomaha.org; click on ‘Jewish Press.’ Editorials express the view of the writer and are not necessarily representative of the views of the Jewish Press Board of Directors, the Jewish Federation of Omaha Board of Directors, or the Omaha Jewish community as a whole. The Jewish Press reserves the right to edit signed letters and articles for space and content. The Jewish Press is not responsible for the Kashrut of any product or establishment. Editorial The Jewish Press is an agency of the Jewish Federation of Omaha. Deadline for copy, ads and photos is: Thursday, 9 a.m., eight days prior to publication. E-mail editorial material and photos to: avandekamp@jew ishomaha.org; send ads (in TIF or PDF format) to: rbusse@jewishom aha.org. 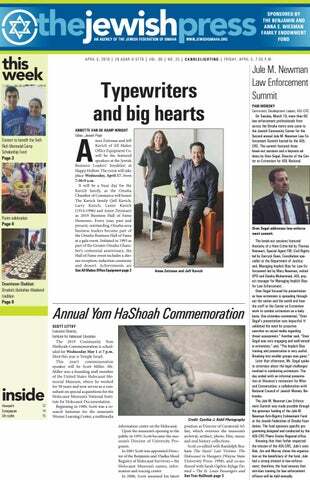 Letters to the Editor Guidelines The Jewish Press welcomes Letters to the Editor. They may be sent via regular mail to: The Jewish Press, 333 So. 132 St., Omaha, NE 68154; via fax: 1.402.334.5422 or via e-mail to the Editor at: avandekamp@jew ishomaha.org. Letters should be no longer than 250 words and must be single-spaced typed, not hand-written. Published letters should be confined to opinions and comments on articles or events. News items should not be submitted and printed as a “Letter to the Editor.” The Editor may edit letters for content and space restrictions. Letters may be published without giving an opposing view. Information shall be verified before printing. All letters must be signed by the writer. The Jewish Press will not publish letters that appear to be part of an organized campaign, nor letters copied from the Internet. No letters should be published from candidates running for office, but others may write on their behalf. Letters of thanks should be confined to commending an institution for a program, project or event, rather than personally thanking paid staff, unless the writer chooses to turn the “Letter to the Editor” into a paid personal ad or a news article about the event, project or program which the professional staff supervised. For information, contact Annette van de Kamp-Wright, Jewish Press Editor, 402.334.6450. Postal The Jewish Press (USPS 275620) is published weekly (except for the first week of January and July) on Friday for $40 per calendar year U.S.; $80 foreign, by the Jewish Federation of Omaha. Phone: 402.334.6448; FAX: 402.334.5422. Periodical postage paid at Omaha, NE. POSTMASTER: Send address changes to: The Jewish Press, 333 So. 132 St., Omaha, NE 68154-2198 or email to: jpress@jewishomaha.org. bipartisan way, despite the corrosive tribalism that has infected American politics. In 2016, when then-presidential candidate Donald Trump enraged many of us with an AIPAC speech containing a diatribe against President Obama, AIPAC’s president admonished him in a general session and issued a clear commitment to bipartisanship. When Prime Minister Benjamin Netanyahu attempted to mainstream the far-right Israeli party Jewish Power, or Otzma Yehudit, shocking the American Jewish community, AIPAC condemned the group. AIPAC invites every member of Congress and countless other elected officials to its annual policy conference, regardless of political affiliation. At this year’s conference, over half the members of Congress came to speak or spend time with the 18,000 attendees, including Democratic leaders Rep. Nancy Pelosi and Sen. Chuck Schumer. At times I live in tension with AIPAC, but I see that as a good thing. Tension is a natural part of public life. As I learned as an organizer, without friction, there is no electricity. As a rabbi, I have built a good working relationship with AIPAC staff. Every time I feel something is going the wrong way at a policy conference, like when a politician slams the other party, I’m quick to call AIPAC leaders and demand an explanation. In these accountability conversations, I have always been treated with respect and honesty. Through AIPAC and its affiliate American Israel Education Foundation, I have met with Arab Israelis, Palestinian businesspeople and the political elite. I have met with progressive Israeli organizations aggressively working to end the occupation. No AIPAC office has ever hidden the wrinkles of Israeli policy when I have asked. Power in democracies is derived from the collective political will of the people. It is only through shared interests and broad coalitions that great ideas can become hard-won realities. AIPAC understands that, and in many ways we need this kind of bipartisan, broad leadership more now than ever. Rabbi Noah Farkas is a rabbi at Valley Beth Shalom in Encino, California. He can be contacted at nfarkas@vbs.org. RABBI NoAH fARKAS LOS ANGELES | JTA I am a rabbi and progressive faith leader in this city who has fought for racial and economic equality for almost two decades. I am also an unapologetic Zionist and a proud supporter of AIPAC. The public perception of AIPAC among my fellow progressives is that it is a white, Trump-supporting, right-wing organization for millionaire donors. In this progressive imagination, AIPAC is a place where evangelical Christians join with their Jewish ideological counterparts to leverage undue influence over American politics. Nothing can be further from the truth. AIPAC welcomes anyone who wants to support a relationship between Israel and the United States. During the past two days at AIPAC’s annual policy conference, I spent time with hundreds of people from all walks of life and a diverse range of cultures. I watched the crowds give standing ovations to progressive politicians and grassroots activists alike. When it comes to Israel, many of my fellow progressives feel upset when I am open about being Zionist. For the past many years, there has been a litmus test in progressive movements around Israel. Unless one condemns Israel at every opportunity, or pushes for the boycott of Israel and Israelis around the world, Zionists are looked on as interlopers into the movement for collective liberation. At the Chicago Dyke March in 2017, Jewish activists were asked to leave because they were waving a rainbow flag bearing a Star of David. That same year, the Democratic Socialists of America passed a BDS resolution. There is the ongoing drama between the Jewish community and the Women’s March. Many progressive Jews feel they have to be anti-Zionist to be considered “good Jews” in progressive spaces. Of course, there are many times that the actions of the Israeli government should be condemned. When the sitting prime minister limits religious pluralism, is about to be indicted and has made bedfellows with right-wing extremists both at home and abroad, we must speak out against his actions – because of our Zionism, not in spite of it. own minds; maybe, when they do, they come to a different conclusion and do the opposite of what you want. The store couldn’t have asked for a better marketing campaign. Just in case you’re worried; HEMA is in the process of restocking their shelves. And yes, my own mother got her hands on a few bottles. Editorials express the view of the writer and are not necessarily representative of the views of the Jewish Press Board of Directors, the Jewish Federation of Omaha Board of Directors, or the Omaha Jewish community as a whole. Luther King Jr. were all advocates of Israeli survival and success. e progressive PAC MoveOn called on Democratic presiBut Obama led a dramatic reversal. Stating that we needed dential candidates to skip AIPAC this year. e Women’s “daylight” between the United States and Israel, the two-term March leader Linda Sarsour tweeted in 2016 that AIPAC is president picked political fights with Prime Minister Ben- “anti-Palestinian, anti-human rights,” and this year accused jamin Netanyahu over borders and settlements, including in the organization of funding anti-Muslim groups. eastern Jerusalem, tilted toward Israel’s hostile enemy, the ShiLe-wing hostility to Israel is so pronounced by now that ite regime in Iran, leaked Israeli defense actions in Syria and, AIPAC cannot appease it. e campus radicals have come to in a parting shot, sided against IsCongress. Six of the seven Democrat rael on a one-sided Security Counsenators running for president opcil vote at the United Nations. posed recent anti-BDS legislation in When Obama endorsed the Senate. Congressional votes against Jerusalem as Israel’s eternal capital anti-Semitism are now watered down. to an AIPAC audience, but then AIPAC may have to adjust to the immediately reversed himself, messy real world of an increasingly AIPAC kept quiet. Whenever his partisan Washington, D.C., which secretary of defense, Chuck Hagel, now features anti-Israel voices rapidly who had gotten in trouble for caschanging the Democratic Party. If it tigating “the Jewish lobby,” critihopes to continue to be eﬀective and cized AIPAC, the lobby remained respected, AIPAC must redouble its mute. When Obama spoke in the support for those in both parties who Arab world in 2009 with a perni- President Barack Obama addresses the annual oppose the anti-Israel le, rewarding cious narrative that Israeli sover- AIPAC policy conference, March 4, 2012. friends and punishing enemies. Credit: Chip Somodevilla/Getty Images eignty was rooted in recovery from AIPAC President Howard Kohr’s the Holocaust, AIPAC did not answer back to argue for the speech at this year’s policy conference certainly made it clear 3,000-year Jewish history in Jerusalem. that AIPAC will not allow attacks on the lobby to go unanBy 2012, Democratic National Convention delegates were swered. But if AIPAC had confronted Democrats earlier, booing the idea that Jerusalem was the capital of Israel. Obama may never have pursued his dangerous Iranian policy, To appease these progressives, AIPAC treaded very cau- which AIPAC gamely fought but lost. While AIPAC does not tiously in confronting Obama, seeking access and accommo- rate or endorse candidates, it can certainly use care not to indation by choosing one of his political supporters, Lee “Rosy” vite as speakers those who endorsed the Iran nuclear deal or Rosenberg, to serve as its president in 2010. fail to condemn by name AIPAC’s most aggressive opponents. AIPAC has long been aware of the anti-Israel le. But today, So, AIPAC, kindly note: Appeasement doesn’t work. many Democratic organizations and activists have moved Larry Greenfield is a fellow at the Claremont Institute for sharply toward that once minority position, creating an en- the Study of Statesmanship & Political Philosophy. ergy that has intimidated traditionally pro-Israel Democrats. Join us for our monthly Shabbat Speakers Series on april 12, at 7:30 p.m. with guest speaker Rich Juro on Visiting synagogues all over the world while traveling with his wife Fran. Our service leader is Larry Blass, and as always, an Oneg to follow service. Everyone is always welcome at B’nai Israel! For information on our historic synagogue, contact any of our board members: Scott Friedman, Rick Katelman, Howard Kutler, Carole Lainof, Wayne Lainof, Sissy Silber, Nancy Wolf, or email nancywolf16620@gmail.com. Services conducted by Rabbi Steven Abraham and Hazzan Michael Krausman. friday: L’dor Va’ Dough Delivery Day, 10 a.m.; Kabbalat Shabbat, 6 p.m. Saturday: Shabbat Morning Service, 9:30 a.m.; Junior Congregation, 10 a.m.; Mincha following Shabbat morning services. weekday SerViCeS: Sundays, 9:30 a.m. & 5:30 p.m.; weekdays, 7 a.m. & 5:30 p.m. Sunday: BESTT Classes, Grades K-7, 9:30 a.m.; Kindergarten Round Up, 9:30 a.m.; Torah Study, 10 a.m.; God 101, 10 a.m. with Rabbi Abraham; Torah Tots, 10:30 a.m. tueSday: A Journey through the Talmud, 11:30 a.m. with Rabbi Abraham; Mahjong, 1 p.m.; Chesed Committee visits Remington Heights, 2 p.m.; Miriam Initiative Book Swap, 7 p.m. at Nancy Rips home. wedneSday: L’dor Va’ Dough Delivery Day, 10 a.m.; BESTT Classes, Grades 3-7, 4:15 p.m.; Sing unto the Lord a new song, 6 p.m. with Hazzan Krausman; Hebrew High, 6:30 p.m.; A Journey through the Talmud and Rabbinic Literature, 7:15 p.m. with Rabbi Abraham. tHurSday: Breakfast and Brachot: Service, 7 a.m. and Breakfast, 7:30 a.m.; Shanghai, 1 p.m. Shabbat B’Yachad, friday, april 12, 6 p.m. Shabbat’s Cool, Grades 3-7, Saturday, april 13, 10 a.m. USY/Kadima Program, Sunday, april 14, noon–2 p.m. at Altitude Trampoline Park. Contact Amy to RSVP, complete a waiver and/or volunteer to be a parent driver. USY Chocolate Seder, Sunday, april 14, 6–7:30 p.m. at Eadie's house. Call Eadie at 402.612.4834 if you need a ride. Services conducted by Rabbi Ari Dembitzer friday: Shacharit, 7 a.m.; Mincha, 7:36 p.m.; Candle Lighting, 7:36 p.m. Saturday: Shacharit, 9 a.m.; Insights into the Weekly Torah Portion, 6:35 p.m.; Mincha/Seudah Shlishit, 7:20 p.m.; Havdalah, 8:37 p.m. Sunday: Shacharit, 9 a.m.; Mincha/Ma’ariv, 7:40 p.m. at Rose Blumkin Jewish Home. monday: Shacharit, 7 a.m.; Jewish History — Your History, noon with Rabbi Shlomo; Mincha/Ma’ariv, 7:40 p.m. at Rose Blumkin Jewish Home. tueSday: Shacharit, 7 a.m.; Torah Tuesday, 3 p.m. with Rabbi Ari; Mincha/Ma’ariv, 7:40 p.m. at Rose Blumkin Jewish Home. wedneSday: Shacharit, 7 a.m.; Board of Commissioners Meeting, 6:30 p.m.; Mincha/Ma’ariv, 7:40 p.m. at Rose Blumkin Jewish Home. tHurSday: Shacharit, 7 a.m.; Connecting with Our Faith, 9:30 a.m. with Rabbi Ari; Mincha/Ma’ariv, 7:40 p.m. at Rose Blumkin Jewish Home. Office hours: Monday-Thursday, 8 a.m.-4 p.m. and Friday, 8 a.m.-2 p.m. Services conducted by Rabbi Mendel Katzman. friday: Shacharit, 7 a.m. followed by coffee, treats, study and shmoozing. Saturday: Shabbat Morning Service, 9:30 a.m. weekdayS: Shacharit, 7 a.m. followed by coffee, treats, study and shmoozing. monday: Personal Parsha class, 9:30 a.m. with Shani. wedneSday: Mystical Thinking, 9:30 a.m. with Rabbi Katzman. tHurSday: Talmud Class, noon with Rabbi Katzman. All programs are open to the entire community. For more information call 402.330.1800 or visit www.ochabad.com. Services conducted by Rabbi Teri Appleby. friday: First Friday Family Shabbat Service, 6:30 p.m. music by Jon Leo and Steve Kaup; Oneg, 7:30 p.m. hosted by Aimee Hyten; Candlelighting, 7:38 p.m. Saturday: Shabbat Morning Service, 9:30 a.m.; Torah Study on Parashat Tazria, 10:45 a.m.; Havdalah (72 minutes), 9:09 p.m. Sunday: LJCS Gan through Grade 7, 9:30 a.m.; LJCS Gesher, 10 a.m.; Adult Hebrew Prayer Class, 11:30 a.m.; Come learn and play Pickleball, 7-9 p.m. All equipment furnished. Wear comfortable clothing. For questions, call or text Miriam Wallick at miriam57@aol.com. wedneSday: LJCS Hebrew School, 4 p.m. at TI. 35th Annual Mayor’s Interfaith Prayer Breakfast, friday, april 12, 7:30 a.m. with guest speaker: Pardeep Singh Kaleka, Forgiveness Project, Partner andFounder, Serve2Unite at Lincoln Station Great Hall, 201 N. 7th Street , Lincoln (7th & P Streets in the Haymarket. Allow ample time for parking. Admission is $30/person at www.eventbrite.com or mail in registration form by Monday, April 8 Spring Garden Clean-up, Sunday, april 14, 9-10:30 am. We’ll be cleaning up the garden beds and trimming plants. If you have any of these items, please bring them: gloves, hand trimmers, paper garden trash bags/trash containers, rakes, brooms, string trimmer, etc. Let Ellin Siegel know if you have any questions at ellin.siegel@gmail.com. Community Passover Seder, Saturday, april 20, 6 p.m. Cost is Adults $18, Children ages 5-12, $9, Children under 5, college students and active military are free. If you need assistance paying for dinner, please contact Rabbi Appleby at rab bi@southstreettemple.org or at 423.763.8007. Donations to subsidize Seder attendees are welcomed. RSVP by April 15. Call the Temple office: 402.435.8004 or e-mail office@ southstreettemple.org. Volunteers to help with set up, plating, or clean up are welcome. Contact the Temple office if you’d like to help! It’s not too soon to be thinking about summer camp! All Federation families are eligible for Camp Incentive Grants of $300 per camper to pay the initial camp registration deposit. Application packets are available in the Temple office and on the Temple website. friday: Services, 7:30 p.m. every first and third of the month. Saturday: Services, 9:15 a.m. led by Jim Polack. Services will be held in the Chapel. Members of the community are invited to attend. a great tour for newcomers who want to learn about the rich Jewish history of Omaha, those who have lived here all their lives and just want to reminisce, and everyone in between! Cost is $10. RSVP to Temple Israel, 402-556-6536. wedneSday: Religious School Grades 3-6, 4 p.m.; School Dinner, 6 p.m.; Grades 7-12, 6:30 p.m.; Family School, 6:30 p.m.; More Precious than Rubies: Parting Wisdom, 6:30 p.m. with Cantor Shermet. tHurSday: The History of the Jewish People: Theodor Herzl and Political Zionism, 10 a.m. with Rabbi Azriel. L’dor V’dor Chocolate Shabbat, friday, april 12, Dinner and Link Workshop, 5:15 p.m., Service, 6 p.m. Temple Israel Blood Drive, Sunday, april 14, 8:30 a.m.2 p.m. Make your appointment to donate your life saving gift! Register online (rcblood.org/2uxnjHi) or by calling 1.800.RED.CROSS. Questions? Contact Executive Director Dennis DePorte, 402.556.6536. OTYG Pancake Feed featuring The Pancake Man, Sunday, april 14, 9 a.m. Temple Tots, Sunday, april 14, 10:30 a.m. Passover Family Seder, Saturday, april 20, 6 p.m. This is a family-friendly event and children will be rewarded for participating in the Seder with an exciting search for the afikoman after the meal. Reservations are required and your payment is your reservation. To reserve your seat at the table, your RSVP must be made by Friday, April 12. Cost of the dinner is $27 for adults, $14 for children ages 6-12, and no charge for children ages five and under. After April 12, the cost of the dinner increases to: $37 for adults, $24 for children 6-12. Services conducted by lay leader Nancy Coren. Office hours: monday-friday, 9 a.m.-1 p.m. friday: No Services; Candlelighting, 7:37 p.m. Saturday: Shabbat Morning service, 10 a.m. followed by a light Kiddush Luncheon; Got Shabbat, 11 a.m.; Havdalah (72 minutes), 8:39 p.m. Sunday: LJCS Gan through Grade 7, 9:30 a.m.; LJCS Gesher, 10 a.m.; Tifereth Israel Board Meeting, 1 p.m.; Come learn and play Pickleball, 7-9 p.m. All equipment furnished. Wear comfortable clothing. For questions, call or text Miriam Wallick at miriam57@aol.com. wedneSday: LJCS Hebrew School, 4 p.m. at TI. tHurSday: Hebrew Reading class, 7 p.m. at the synagogue taught by Nancy Coren. Please let her know if you plan to attend and bring a pack of index cards with you. 35th Annual Mayor's Interfaith Prayer Breakfast, friday, april 12, 7:30 a.m. at Lincoln Station Great Hall, 201 N 7th Street, Lincoln with featured speaker is Pardeep Singh Kaleka, a former police officer and inner-city educator, and co-founder of Serve2Unite. Join us for a Communal Seder at Tifereth Israel. You can choose from 2 options: A traditional Passover seder, friday, april 19, 6 p.m. or Escape from Egypt-A lock box experiential seder (interactive/kid friendly ages 0-13), Saturday, april 20, 6 p.m. Doors open at 5:30 p.m. Reserve a place now for yourself and your family! Cost: Free to all but donations to help defray expenses may be contributed to the Layleader Discretionary Fund. RSVP: Office at 402.423.8569 by APRIL 1 to say you're coming or e-mail ncoren@tiferethis raellincoln.org It’s not too soon to be thinking about summer camp! All Federation families are eligible for Camp Incentive Grants of $300 per camper to pay the initial camp registration deposit. Application packets are availible in the Tifereth Israel foyer. mination camp. After World War II, Schaufeld moved to Israel and lived on a kibbutz, where she met her husband, Avram, a fellow Holocaust survivor (he survived Auschwitz and Buchenwald). They eventually moved back to Britain, where she helped establish The National Holocaust Centre and Museum and worked with the Holocaust Education Trust to help increase awareness of the Holocaust in Britain. Schaufeld, a mother of two and grandmother of four, has been a teacher her entire life. Tziporah and Max Marcovitz of Beitar Illit, Israel, announce the March 13 birth of their son, Binyomin. He has four siblings, Nachum, Hadassah, Batsheva Esther and Dovid Schlomo. Grandparents are Mimi Rogers and Scott Farkas of Frisco, Texas. Great-grandparents are Jerry Farkas and Elaine and Ronald Marcovitz, all from Florida. ATTeNTION ADverTIsers! For $225/25 word classified you can advertise in over 162 Nebraska newspapers. For more information contact the Jewish Press or call 1-800-369-2850. JFs pinwheel planting crew for 2019: David Purdham, left, Danny Purdham, Kenley Talmon, Brody Talmon, Matt Talmon, Brecken Talmon, and Lucas Purdham. BANKruPTcy: Free initial consultation. Fast relief from creditors. Low rates. Statewide filing. No office appointment necessary. Call Steffens Law Office, 308872-8327. steffensbankruptcylaw.com. We are a debt relief agency, which helps people file bankruptcy under the bankruptcy code. AFFOrDABLe Press Release service. Send your message to 164 newspapers across Nebraska for one low price! Call 1-800-369-2850 or www.nebpress.com for more details. FINANcIAL BeNeFITs for those facing serious illness. You may qualify for a Living Benefit Loan today (up to 50 percent of your Life Insurance Policy Death Benefit). Free information. Call 1-866-434-4975. DeNTAL INsurANce. Call Physicians Mutual Insurance Company for details. Not just a discount plan, Real coverage for 350 procedures. 855-490-4149 or http://www.dental50plus.com/81 Ad#6118. vIAsAT sATeLLITe Internet. Up to 12 mbps plans starting at $30/month. Our fastest speeds (up to 50 mbps) & unlimited data plans start at $100/month. Call Viasat today: 1-877-255-9312. Joseph Burstein passed away March 24 at age 91. Services were held March 27 where he was honored by many family and friends. He was preceded in death by his wife Geraldine Burstein, parents Jake and Evelyn Burstein and brother, Herman Burstein. He is survived by daughter and son-in-law, Nancy Burstein and Steve Elliott, and sons, Sanford Burstein and Stephen Burstein; brother, Stanley Burstein. Joseph was born in Omaha, where his father was a tailor. He went to Central High School and enlisted in the navy late 1944, and returned to Omaha after World War II. Joseph went to Creighton University and then later to the University of Nebraska in Lincoln. After he graduated he returned to Omaha and met Geraldine Cohn who he married in 1950. In the ensuing years they had three children and moved to St. Louis (Creve Coeur) in 1967 where they lived for the next 52 years. Geraldine passed in 2016. Joseph’s children live in New York, New Jersey and Taiwan. Joseph was an executive in the trucking firm Associated Transports in St. Louis and later owned Chestnut Mountain Ski Resort in Galena Ill for more than 25 years. During this period he was also the chairman of the board of LMI Aerospace in St. Charles, MO. Joseph and Geraldine were members of Beth Israel synagogue while living in Omaha and Brith Sholom Synagogue in St. Louis for most of their 50 years. They were married for 66 years. Joseph celebrated his 91st birthday on Nov. 18, 2018. Memorials may be made to the Anti-Defamation League, Jewish Family and Children’s Service or the organization of your choice. Noah Atlas, son of Stacey and Brett Atlas, will celebrate his Bar Mitzvah on Saturday, April 13, at Temple Israel. Noah is a seventh-grade student at Westside Middle School where he is an Honors math student and a participant in the Duke University Talent Identification Program. Noah is interested in basketball, tennis, making music and hanging out with friends. For his mitzvah project, Noah volunteered for the Special Olympics. He has a brother, Zach and a sister, Marley. Grandparents are Zoë and Carl Riekes, the late Ronald Atlas, and Ellen and Don Israel. DIrecTv & AT&T. 155 Channels & 1,000s of Shows/Movies On Demand (w/Select Package). AT&T Internet 99 Percent Reliability. Unlimited Texts to 120 Countries w/AT&T Wireless. Call 4 Free Quote, 1-855-977-3794. MArcy OsTer JTA A visitor to the site of the Auschwitz-Birkenau Nazi death camp was caught trying to steal a piece of the camp’s iconic rail tracks. e American visitor, 37, who was apprehended by police in Oswiecim in southern Poland, was charged with attempted the of an item of cultural importance, the Associated Press reported. e incident was first reported by police and Auschwitz-Birkenau State Museum oﬃcials on March 31. e man admitted his guilt and was released until further legal action is taken. He could face up to ten years in prison. He had attempted to remove a metal piece from the tracks where people were unloaded from train cars at the entrance to the death camp. MArcy OsTer Facebook by Likud camJERUSALEM | JTA paign oﬃcials and NeHundreds of social media tanyahu’s son, Yair. accounts, many of them fake, e network could violate are working together to help Israeli laws pertaining to the re-election eﬀorts of Iselections, campaign finance, raeli Prime Minister Benprivacy and taxation, accordjamin Netanyahu and his ing to the report. Likud party, an Israeli watchA Likud spokesman told dog group found. e Times that the party does e group, called the Big not run a network of fake accounts. Bots Project, found no links “All of the Likud’s digital between the network of soactivity is entirely authentic,” cial media accounts and Netanyahu or Likud in its Hundreds of fake social media accounts are working together to Jonathan Urich said, “and is report. e New York Times help Prime Minister Benjamin Netanyahu and his Likud Party, a based on the great support of Credit: iStock the citizens of Israel for saw an advance copy of the report by an Israeli watchdog group found. report, due to be released April 1. Prime Minister Netanyahu and the great achievements of Some 154 of the accounts in the network use fake names the Likud.” and another 400 are suspected of being fake but appear to e report was written by Noam Rotem and Yuval Adam, be operated by actual people, which makes them harder to founders of the Big Bots Project. eir investigation was asdetect, according to the report. eir posts, all in Hebrew, sisted by the Israeli Alliance, a liberal group calling for social have had over 2.5 million hits. change in Israel, and financed through an Israeli online eir messages have been retweeted and reposted on crowdfunding site, Drove. DIsH NeTwOrK $69.99 for 190 Channels. Add High Speed Internet for Only $14.95/month. Best Technology. Best Value. Smart HD DVR included. Free Installation. Some restrictions apply. Call 1-877-688-4784. A PLAce For Mom. The nation’s largest senior living referral service. Contact our trusted, local experts today! Our service is Free/no obligation. Call 1-855-441-8821. ATTeNTION: OXyGeN Users! Gain freedom with a Portable Oxygen Concentrator! No more heavy tanks and refills! Guaranteed lowest prices! Call the Oxygen Concentrator Store: 888-491-3421.
crAFTMATIc ADJusTABLe beds for less! Up to 50% off leading competitors. #1 Rated Adjustable Bed. Trusted over 40 years. All mattress types available. Shop by phone and Save! Call 1-877-745-9515. LIFe ALerT, 24/7. One press of a button sends help fast! Medical, Fire, Burglar. Even if you can’t reach a phone! Free Brochure. Call 855-663-0118. PuT ON your TV ears and hear TV with unmatched clarity. TV Ears Original were originally $129.95, now with this special offer are only $59.95 with code MCB59! Call 1-855-404-3553.
sTAy IN your home longer with an American Standard Walk-in Bathtub. Receive up to $1,500 off, including a free toilet, and a lifetime warranty on the tub and installation! Call us at 1-888-332-9560. FAMILy PrAcTIce Clinic located in the beautiful Sandhills seeks a clinic manager. Individual must possess strong communications, finance, and personnel skills. Experience preferred. Competitive compensation and benefit package. Send resume: Brent Peterson, Cherry County Hospital, PO Box 410, Valentine, NE 69201 or apply online. EEO/Vet/Disabled employer. ceNTer PIvOT Service Experience preferred but will train. Excellent compensation with overtime pay. Driver’s license required. Full-time and seasonal available. Benefits provided. Holzfaster’s Equipment, Ogallala, NE, 308-284-2063. LuBe/servIceMAN and Motor Scraper Operators needed for Grading Contractor. 100% Paid Health/Dental Insurance. Simple IRA. Apply to: Commercial Contractors Equipment, 701 NW 27th Street, Lincoln, NE 68528, 402-476-1711, ccei@nebr.rr.com. EOE cOMPuTer Issues? Free Diagnosis by Geeks On Site! Virus Removal, Data Recovery! 24/7 emergency service, In-home repair/On-line solutions. $20 off any service! 877-774-3624 HAve 10K in Debt? National Debt Relief is rated A-Plus with the BBB. You could be debt free in 24-48 months. Call 1-866-834-5927 now for a free debt evaluation. BecOMe A Published Author. We want to read your book! Dorrance Publishing trusted by authors since 1920. Book manuscript submissions currently being reviewed. Comprehensive Services: Consultation, Production, Promotion and Distribution. Call for your free Author’s Guide, 1-877-858-2822 or visit http://dorranceinfo. com/Nebraska. DONATe yOur car for Breast Cancer! Help United Breast Cancer Foundation education, prevention & support programs. Fast free pickup - 24 hour response - tax deduction. 1-888-309-7108.